Air Mic Live Audio allows you to listen to the live audio stream (with about five seconds of delay depending on the network) captured from your PC or Mac's built-in microphone. You can use Air Mic as a remote home surveillance tool to discretely monitor the activity of your children or elderly. All you need is a running PC or Mac at the monitored location, and you can listen to what is going on with Air Mic anywhere using 3G/WiFi network on your iPhone/iPod Touch. * Live audio streaming from your PC/Mac's audio input (mic or line-in). * Works with WiFi/3G with automatic connection. No configuration needed on most routers. * Also support manual connection using computer's IP address. 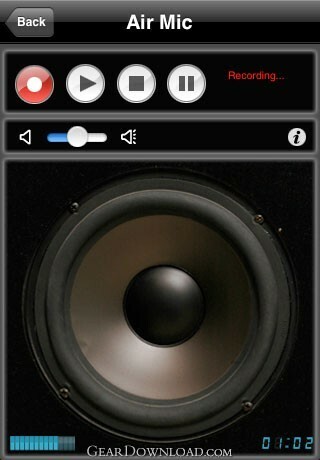 * Record the live audio feed directly on your iPhone/iPod. * Password protection of Air Mic access. * WiFi-sync of the recorded audio files. * iPhone or iPod Touch with V2.2. * Or a Windows XP/Vista system. * A shared Wi-Fi network between your Mac computer and your iPhone/iPod Touch. This version of Air Mic also work over Edge or 3G networks. * Download and run the free Mac or Windows software from http://www.senstic.com/iphone/airmic/airmic.aspx to stream your feed. This download (AirMicSetup.msi) was tested thoroughly and was found 100% clean. Click "Report Spyware" link on the top if you found this software contains any form of malware, including but not limited to: spyware, viruses, trojans and backdoors.